Written for students and professionals in the field, Offshore Wind Energy Technology is a definitive resource that reviews all facets of offshore wind energy technology and grid connection. 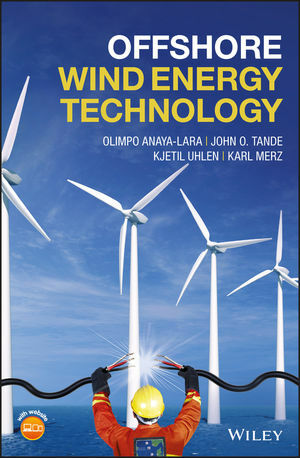 OLIMPO ANAYA-LARA is a Reader in the Wind Energy and Control Centre at the University of Strathclyde, Glasgow, UK. JOHN O. TANDE is a Chief Scientist with SINTEF Energy Research and Director of NOWITECH, Norway. KJETIL UHLEN is a Professor in Electrical Power Systems at the Norwegian University of Science and Technology (NTNU), Norway. KARL MERZ is a Research Scientist at SINTEF Energy Research, Norway.